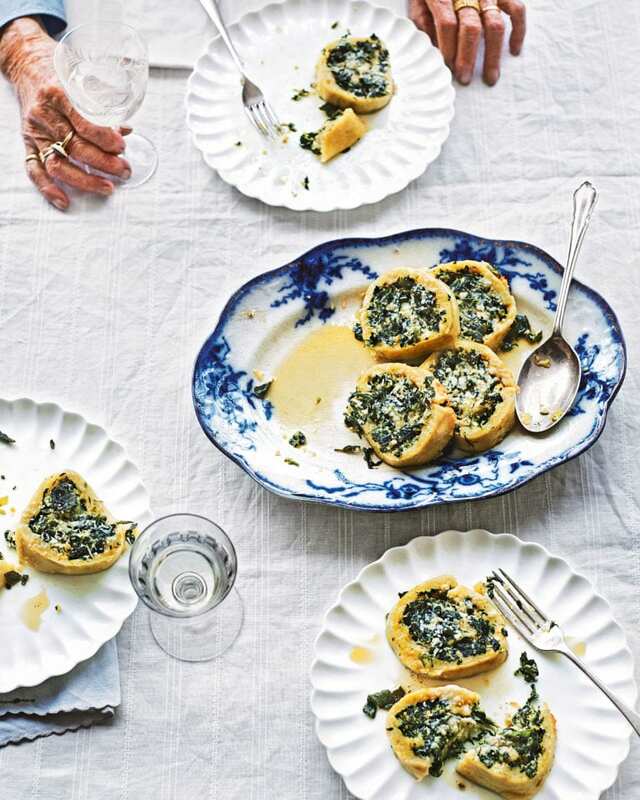 This recipe for Anna Del Conte’s vegetarian roll filled with spinach, ricotta and leek is perfect for when you have a little extra time and want to impress friends and family. She says: ”Usually this is made with homemade pasta dough but this is my mother’s recipe made with potato gnocchi dough. It requires love and time, but both are amply rewarded”. This recipe is from Anna’s book Vegetables all’Italiana. Put the potatoes in a large pan and cover with water. Add 1 tbsp salt, bring the water to a simmer and cook until easily pierced by the point of a knife. Drain and peel as soon as they are cool enough to handle. Put the oil and 25g of the butter in a lidded saucepan and, when the butter has melted, add the leek and a pinch of salt. Cover tightly and let the leek fry gently for 20-25 minutes on the lowest possible heat. Put the spinach on a chopping board and slice it roughly. Add to the leek, turn the heat up to high and allow the spinach to absorb the leek liquid, while stirring. Transfer the mixture to a bowl. Add the ricotta, 4 tbsp of the grated cheese, a good grating of nutmeg and plenty of pepper. Mix very thoroughly, then taste and adjust the seasoning. Now go back to the potatoes. Pass the potatoes through a potato ricer or push through a sieve straight onto a clean work surface. Make a well in the middle of the potato mound and break the egg into it. Gradually work in enough flour to shape the mixture into a ball. It’s difficult to give the exact quantity of flour because it depends on the quality of the potatoes and the heat and humidity of your kitchen. Whatever you do, don’t add all the flour at once; add it gradually and stop when the dough is firm enough to be shaped into a ball, albeit still on the sticky side, just as when making potato gnocchi. Allow the dough to cool a little. Cut a piece of non-stick baking paper into a 50cm x 40cm rectangle and put it on the work surface. Put the dough on top of the paper (see tips) and roll it out to a rectangle about 35cm x 25cm. Spread the spinach filling over the dough, leaving a 2cm border all round. With the help of the paper, roll the potato dough into a log shape from a long end, just as you would with a swiss roll. Press down each end to seal, then wrap the paper around the roll (see tips). Half fill the pan, fish kettle or roasting tin with water and set over a medium-high heat. Add 1 tbsp salt and bring the water to the boil. Gently lower the roll into the water, which should just cover the roll. When the water is boiling again, turn the heat down to a simmer and cook for 30 minutes. Heat the oven to 180°C/160°C fan/gas 4. Gently lift the roll out of the water and transfer to a chopping board. Leave to cool for 5 minutes before unwrapping it (see Make Ahead). It will be far easier to slice when cool. Using a sharp knife, cut the roll into 2cm slices. Lay the slices in an ovenproof dish and put the dish in the oven to cook while you prepare the dressing, which is quick and easy. Put the rest of the butter in a small saucepan and heat gently. Add the sage leaves and garlic to the butter. Cook gently until the foam has subsided and the butter begins to colour. Discard the garlic and pour the butter and sage leaves all over the spinach roll. Sprinkle with some of the remaining grated cheese and put the dish back in the oven until heated through (15-30 minutes, depending on whether it was hot or cold). Serve, handing round the rest of the cheese in a bowl. We advise using an additional wrapping of foil to help the roll keep its shape in step 6. If you don’t have a pan big enough for the whole roll, halve the mixture in step 5 to make 2 shorter rolls. Once simmered as a roll (step 6), keep wrapped and chill for up to a day before slicing and baking.